When Jordan and his father, Micah Parker, learn they are being watched, they need to leave Springfield, Illinois, at once. With the stolen money recovered and the thief behind bars, Libby looks forward to returning the money Pa needs to pay off the Christina. Jordan makes plans to travel to Chicago and turn over the gift to help fugitive slaves. But then a dangerous man escapes! If he recognizes Libby, Jordan and Peter will be in danger. When a disguise for Libby seems the only answer, it requires a sacrifice she isn't sure she's willing to make. Arriving in a strange city, the Freedom Seekers look for a safe house--a station in the Underground Railroad where fugitive slaves can hide. When finding help might be a matter of life or death can they spot&a mysterious signal in time? And how does a young teacher named Annika become an important part of their lives? Can the great detective Allan Pinkerton offer the surprising solution they need? Will a life-threatening steamboat accident and Libby's new willingness to forgive her Aunt Vi bring the breakthroughs she needs? 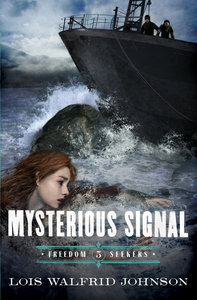 In The Mysterious Signal, the fifth Freedom Seekers novel, as well as others in the series, Lois Walfrid Johnson uses fast-paced storytelling and biblical truth to bring important concepts alive. About "Mysterious Signal (#05 in Freedom Seekers Series)"
LOIS WALFRID JOHNSON is the best-selling author of more than 30 books for children and adults. Her books and shorter pieces have received a variety of awards, including the Gold Medallion Book Award, the C.S. Lewis Award for Best Series, and five Silver Angels from Excellence in Media. Lois loves talking with kids and writing edge-of-your-seat adventures. Set in America just before the Civil War, this exciting series of novels follows the adventures of a group of young people as they risk their lives to help slaves escape to freedom on a Mississippi riverboat. Ages 8-12.